Nestled in rural Spring Lake Township of Scott County, Minnesota, Mark Glewwe has been making home brewed beverages since September 1994. His Beers, Wines, Ciders, and Meads have won several prizes at Minnesota Festivals, Fairs, and Competitions. This root beer recipe is the culmination of many years of experimentation. It has become a favorite drink at home by our family and friends. Mark has provided demonstrations and samples at our children's schools and service organizations. 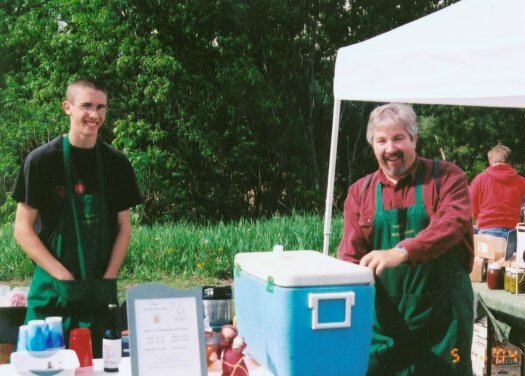 Now, after much coaxing by family, friends, and the managers of the Prior Lake Farmers Market, father and son are venturing out into world of commerce and returning to the family heritage of selling at the farmers market. Mark's grandfather, Frank Glewwe, sold his truck farm produce at the St. Paul's farmers market for many years. 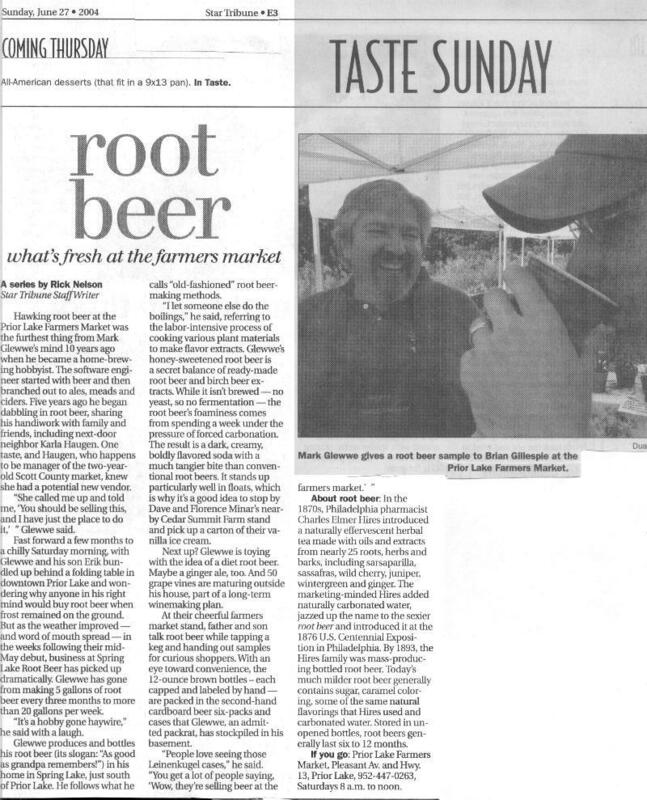 In the Spring of 2004, we were approached by the managers of the Prior Lake Farmers Market to sell our Root Beer. This was a new venture that was faced with lots of trepidation. After some research, the family decided that we could take a shot at "the big time". The up-side potential seemed to outweigh the down-side potential ... and besides, how much trouble can we get into in a single summer. So, on May 15, with the frost almost off the morning grass, father and son bundled up their equipment and set up a modest booth at the opening day of the PLFM. We had been making about 5 gallons of root beer every 3-4 months for family and friends. Within a week of the opening of the market, it was clear we needed enhance our production capacity in order to make significantly more root beer. Despite rain both of the next two weekends, sales increased each week. By the 4th weekend of the market, we sold 35 gallons of root beer in one day. Those free samples must have really paid off. And then publicity began. Rick Nelson, a staff writer of the Minneapolis StarTribue, wrote a nice article about us in a weekly series he was doing on the farmers markets of the Twin Cities. Then Ian Punnett, a talk show host on the FM 107 radio station, asked for an early morning radio interview broadcast live at 5:40 am July 1st - and believe it or not, I met a few people that listened to the interview and came down to the farmers market to check us out. The StarTrib article brought quite a few folk down to the farmers market - and my sales continued to rise and demand was outstripping our production capacity again. Our publicity continues to astonish us. We are not known to seek out the spot light, but it seems to find us. Some of the publicity is noted on our main page. We were not a third of the way through the first market season and it was clear that this very manual, hands-on activity was in desperate need of some automation and larger capacity. In the beginning, all the steps were done by hand - bottle cleaning, filling, labeling. This was very time consuming and greatly limits our capacity to make more root beer. And we are too cheap to pay someone else to do it. So now we are searching for efficient means to produce and bottle/package our root beer, but to be honest it has not changed too much. After much urging from our patrons at the farmer's market, we experimented with Vanilla Cream Soda and Orange Soda during the winter of 2005. We received lots of feedback from family, friends, and our loyal patron on the new products. The end result is an expansion of product. We only hope we are able to meet the demand level. In the end, we had to pull the Orange Soda product for quality control reasons, but the Creme Soda continues to be a hit. Today, we are continuing to work to expand our products, availability, and bring down our costs. This is a very labor intensive activity which brings a unique character to our products, but also limits our current production capacity. Another constant concern is finding bottles. As many of you can attest, the bottles we use may all contain the same amount of soda, but come in many different shapes, heights, and colors. We are extremely grateful to those people who assist us in recycling long neck, crown cap beer bottles. Finally, we are also looking to license our new facility in order to allow us to sell our products in more conventional markets. The whole Glewwe family hopes you enjoy this taste of old world charm. We are also doing research and development on other products. If you have any suggestions, please feel free to contact us. Drinking Root Beer will not impair your vision. Drinking Root Beer will not prevent pregnancy. Drinking Root Beer will not cause weight loss. Drinking Root Beer will not grow hair on your chest (or anywhere else on your body). Root Beer does not carry a Surgeon General's warning label. Drinking Root Beer is not harmful to children, but may cause runs. Drinking Root Beer is not harmful to pets, but may cause runs. Drinking Root Beer can be done by the whole family. Drinking Root Beer does not cause cancer or any other disease, although tooth decay is possible if you do not brush at least twice a day. Drinking Root Beer is legal in all 50 states and in most foreign countries.